This is your to-go guide for what to do in Hawaii Volcanoes National Park. Learn about all the attractions and must-sees in the Volcano Park as well as various hiking trails. Hawai’i Volcanoes National Park is huge and you can easily spend a day or two exploring the different areas of the park. Get the latest eruption information, maps, and day hike trail guides, safety precautions, road conditions, and more from the rangers at the front desk of Kilauea Visitor Center. Check out the which ranger guided tours are available that day. Watch this parks’ famous “Born of Fire, Born of the Sea” movie on the hour (every hour from 9:00 am – 4:00pm) or the eruption update on every half hour. Visit the Hawai’i Pacific Parks Association book store for unique collectibles, posters and more! To learn more about the Kilauea Visitor Center, click here. If you can see only one thing in the park, this is the ultimate attraction to visit. You can learn more about the recent Kilauea Eruption and what happened to the summit crater here. Less than a mile past the Visitor Center is a pull-off for the Steam Vents area, also known as Wahinekapu. The steam vents are formed because ground water seeps into the warm volcanic rock and returns to the surface as steam so you can safely feel the heat from the Volcano through exploring this special area. You may notice the landscape change from rain forest to grassy fields in this special volcanic area. This is because trees roots cannot survive in the heat from the steam vents. The walk from the parking area to the crater overlook and steam vents is .25 miles roundtrip. To learn more about the Steam Vents, click here. Chain of Craters road is the most scenic drive in Hawai’i Volcanoes National Park! 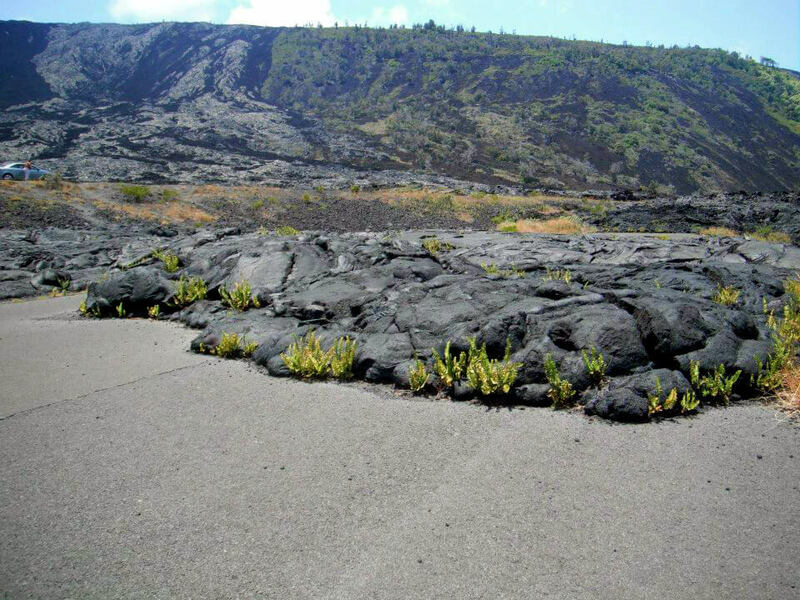 It is a 38-mile round trip drive that intersects the bottom portion of the Crater Rim Drive, descends 3,700 feet to the coast and ends where the 2003 lava flow covered the road. There are many overlooks and different areas to check out along the way which can take several hours to explore completely. Driving is about 45 minutes one direction without stops. This overlook sits on the crest of the Hōlei Pali and gives you an awesome panoramic view of the Pacific ocean as well a the mass amounts of lava flows from Mauna Ulu that covered the ancient village of Kealakomo. If you look out to your left, you may see a giant cloud of dark gasses at the ocean, that is where the lava flow entered the Pacific ocean, creating new land in front of your eyes! 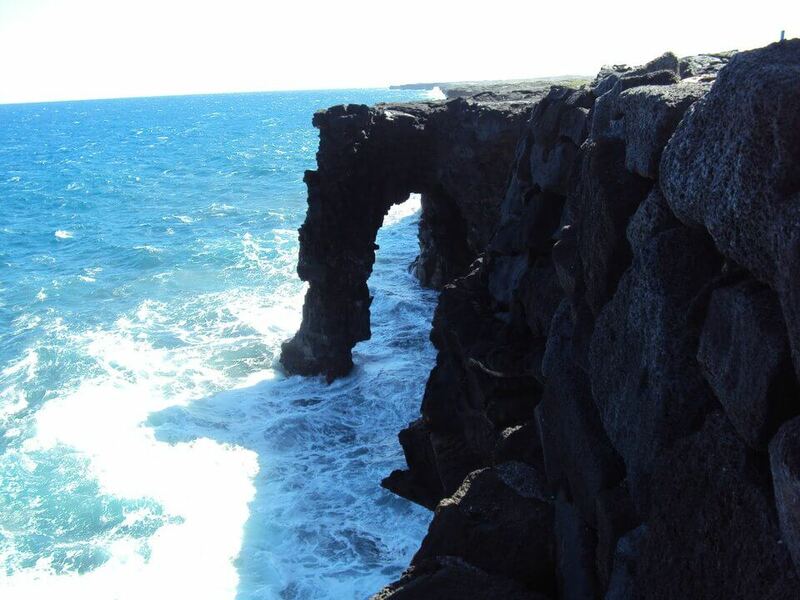 When you drive to the end of “Chain of Craters road”, you will find a short path to visit the Holei Sea Arch. This sea arch contrasts beautifully with the vast deep blue Pacific Ocean, and is quite a beautiful sight to see! It is located on the ocean facing cliff and is about 90 feet tall. Catch a picture of this impressive formation while you can! This sea arch will eventually erode away due to the constant pounding of the salty sea waves. Ke Ala Kahiko literally translates to “The Old Road”. If you visit this stop, you can see where a strip of the old Chain of Craters road got covered from the Mauna Ulu eruptions from 1969 through 1974. Catch a classic “lava over road” picture here! If you look upland to the Pali o Hōlei (Hōlei Cliff) you can see the different colors of lava flows that came down from Mauna Ulu. There are multiple pit craters along this drive, hence the name “Chain of Craters Road”. You can pull over to enjoy the scenery of these collapsed pit craters, each of them a little different from the others. Also from these craters you may see the Native Hawaiian forest bat, ‘Ope’ape’a, as a lot of them live around this area. This road features the biggest fault scarp located on Kilauea Volcano, stretching 10 miles long and 1.5 miles wide, giving it is common nickname: “The Great Crack”. This road will be on your right about 2 miles after the start of Chain of Craters road. It goes out 5 miles to the Hilina Pali Overlook. This area tends to be very windy, as it is located at the top of the Holei Cliff. Hawai’i Volcanoes National Park offers hundreds of miles of hiking trails. Here are a few of Volcano Inn’s top picks for hiking. Hike through a Hawaiian Rain Forest while exploring ‘Iliahi trail! The ‘Iliahi (Sandalwood) trail is an awesome, yet short Hawaiian rain forest hike that offers unique views of the erupted summit crater. Along the trail, you descend about 200 feet into the caldera and hike along the rim through beautiful thriving Hawaiian Rain Forest. The mostly shady loop trail continues and passes through some big cracks caused by the collapse of the summit 500 years ago. These special areas along the caldera rim will cause ground water to rise as steam where you can safely feel the heat from the Volcano. If you get a wave of moist heat along this trail, look around for a steam vent nearby! Quick Tip: When the trail pops you out by the steam vents, there are two different routes that will get you back to the Visitor Center. You are able to cross the street and catch the Sulfur Banks trail (.7 miles ; see below) back to the visitor center or loop it back through the rain forest trail. Update: As of Dec 2018, you can only do the trail by foot or by bike. Walk through a Volcanic Mineral Deposit Zone of an Active Volcano! 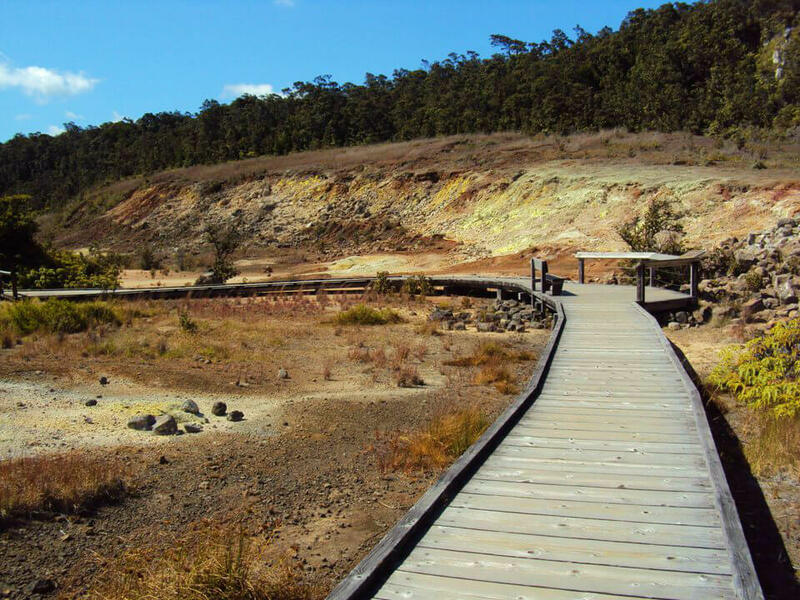 The Sulfur Banks trail is the only trail in Hawai’i Volcanoes National Park that features sulfur mineral deposits. 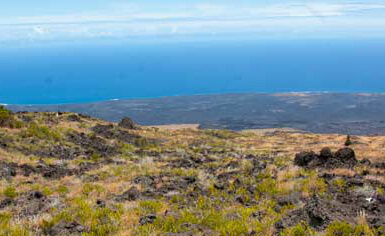 This trail can start by the Visitor Center or on the Steam Vents / ‘Iliahi trail side. It is .7 miles one direction making it 1.4 miles round trip. This thermal area has very deep cracks that release Volcanic gasses. These gases are rich in carbon dioxide, sulfur dioxide and hydrogen sulfide and smells like rotten eggs. Quick Tip: Visitors with heart or respiratory problems (such as asthma), pregnant women, infants, or young children should avoid this walk. Hike up a forested cinder cone to view Mauna Ulu! Along this trail to the top of Pu’u Huluhulu, you can see many cool volcanic features. Some of them are: the 1969 fissure, Pele’s hair, Pele’s tears, lava tree molds, ‘a’ā flows, pāhoehoe flows, and more! When you ascend 200 feet to the top of Pu’u Huluhulu, you get a fantastic view of Mauna Ulu. This volcanic feature started as a crater that filled up with lava and eventually formed a hill approximately 400ft high from its pre-eruption base, hence its name Mauna Ulu, the growing mountain. It continued to erupt from 1969-1974, at one point its fountain eruption reached 1,770 ft! Within the 5 years it was erupting, Mauna Ulu’s flows covered 17 square miles below as it made its way 7 miles to the coast and covered many areas of the previous Chain of Craters road. For a shorter hike at this area, you can do the very short .5 mile loop near the trail head. This short walk shows where the first fissure opened up and started erupting lava in 1969. Download the trail guide for this hike here, provided by National Park Service. 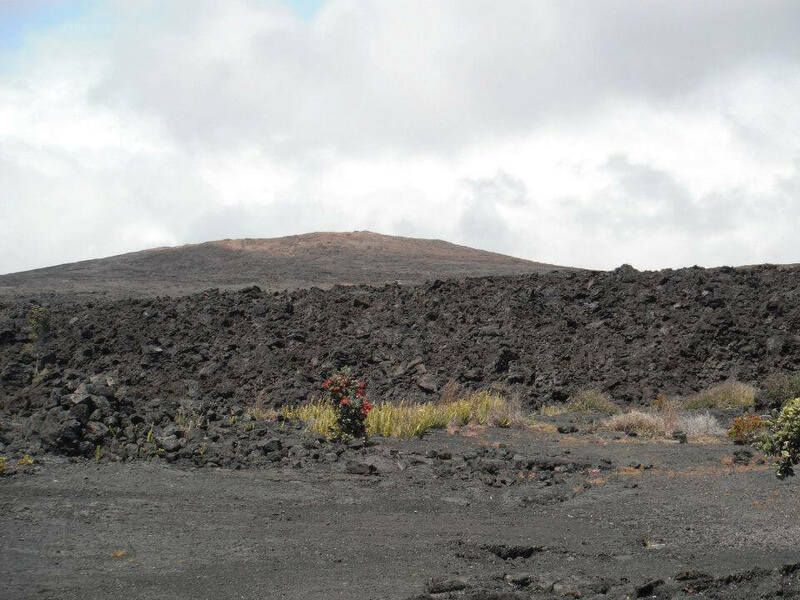 Visit the largest petroglyph field in Hawai’i! See more in this blog post: See Thousands of Hawaiian Petroglyphs! This area is very sacred to many of the people of Hawai’i, an area that has been used ritually for over 500 years. Geologically dated between 1200-1450 A.D., there is a collection of over 23,000 petroglyphs in this area! The petroglyphs are hardest to see when the sun is directly over head so we recommend doing this as an early morning hike or a mid-afternoon hike to get the best viewing of these ancient rock carvings. Avoid doing this hike between 11:30 am – 1:30 pm.